TSM PredictZone: (Gameweek 1) - Who Tops the Table After Opening Week? As you may know, this season the head writers of TSM are going head to head in a prediction league for the Barclays Premier League season. With all the matches completed for the opening gameweek, we were eager to see who is top of the table after an astounding start to the Barclays Premier League 2013/14. 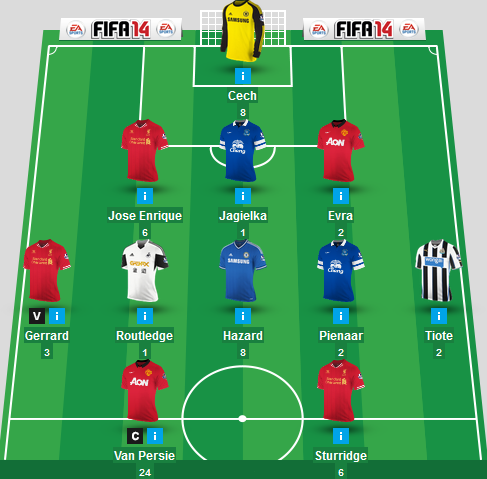 Waqar Hussain ran away with the goods for this week, scoring 41 points out of a possible 99. Perfect scores included the matches Chelsea vs Aston Villa, Crystal Palace vs Tottenham and also Norwich vs Everton. Meanwhile, Nisar Khan and AK are currently tied at 24 points each. AK had perfect scores for Liverpool vs Stoke and Chelsea vs Aston Villa while Nisar guessed perfectly on Chelsea vs Aston Villa and Sunderland vs Fulham. Nisar Khan leads the Fantasy Premier League table for TheSportMatrix admins. Meanwhile, it is a marginal 3 point difference for 2nd place with AK currently 2nd with 52 points. Robin van Persie is the real difference maker for Nisar Khan's team. After scoring two goals and being captain, the points were really totted up for the team. Advantage may have been taken from Chelsea with their two games, and the strikers really performed for iNisarKhan XI. With a fantastic start to the Premier League season, the second gameweek is sure to continue with some more great football from the most captivating league on the planet. There is a huge clash between Manchester United and Chelsea set for Monday night, and that is to be nothing short of special. TheSportMatrix • We Live For Sport: TSM PredictZone: (Gameweek 1) - Who Tops the Table After Opening Week?